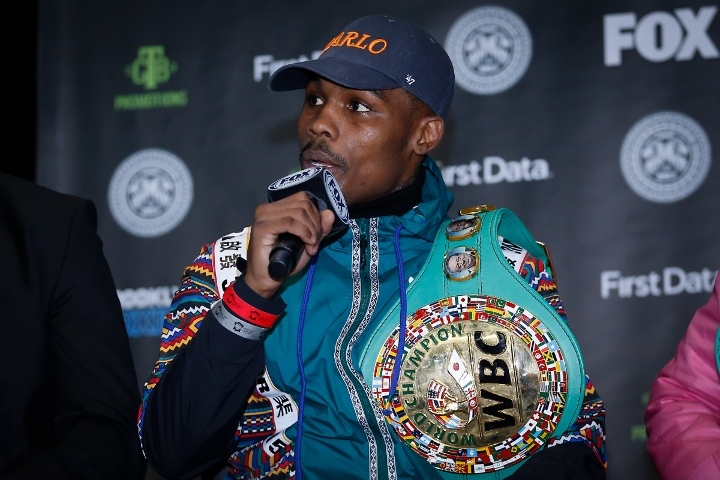 Jermell Charlo was found not guilty Wednesday in a Dallas courtroom on two counts of domestic violence against a former girlfriend. A jury ruled in favor of Charlo after testimony from the woman, previously identified by numerous media outlets as Jazmyne Olison. The former WBC super welterweight champion had been charged with felony domestic assault for allegedly choking Olison and a misdemeanor charge for allegedly striking her. Arnold Joseph, Charlo’s attorney, told BoxingScene.com early Wednesday evening that once the verdict was rendered, Charlo felt a great sense of relief upon leaving the 203rd judicial circuit court in downtown Dallas. Houston’s Charlo, 28, suffered his first professional defeat in his last fight. Detroit’s Tony Harrison (28-2, 21 KOs) upset Charlo (31-1, 15 KOs) by unanimous decision in their 12-round, 154-pound title fight December 22 at Barclays Center in Brooklyn. Their contractually mandated immediate rematch for the WBC super welterweight title likely will take place sometime in June. He beat former WBA champion Austin Trout by majority decision in their 12-round title bout June 9 at Staples Center in Los Angeles. That fight took place three weeks after Charlo was arrested charged in this case last May 18, which Olison told police took place “on or about” last May 17. Charlo posted a $20,000 bond and was released that day. Six months after defeating Trout, he lost his title to Harrison. Arnold believes the stress associated with this case adversely affected Charlo while training for his past two fights. This is the result of being so inactive. [QUOTE=nacho daddy;19610011]yes I am saying he is guilty cause charcoal is a POS[/QUOTE] Oh, so you're a POS racist. Good to know.